Water floats and ice sinks, right? Frozen water is heavier and denser than when it is in its liquid state. Or is it? This activity is all about experimenting with different liquids and their densities. 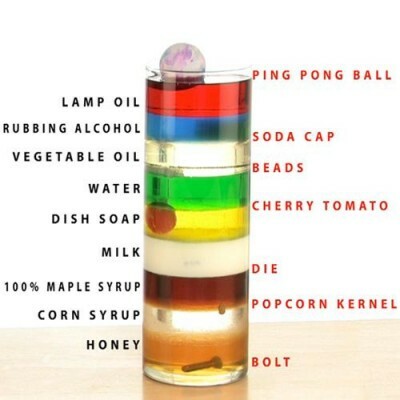 In one of our most popular experiments, the 9-Layer Density Column, each liquid is stacked up on the next and do not separate because of their density. Objects sink to different levels based on their density. Taking a lesson from the 9-Layer Density tower, we tried a new experiment with food coloring, water, an ice cube, baby oil and a mystery liquid. Watch the Sick Science! video and try to guess the mystery liquid before reading further. Did you figure out the mysterious liquid? It was vegetable oil. The basis of the Light Ice, Heavy Water experiment relies on density. Density = mass ÷ volume, which essentially equates to how many atoms are within a certain space. It is tough to see, but when you add baby oil to the vegetable oil in the container, the baby oil settles on top of the vegetable oil. This is because baby oil is a less-dense liquid than vegetable oil. That’s where water comes in to the picture. 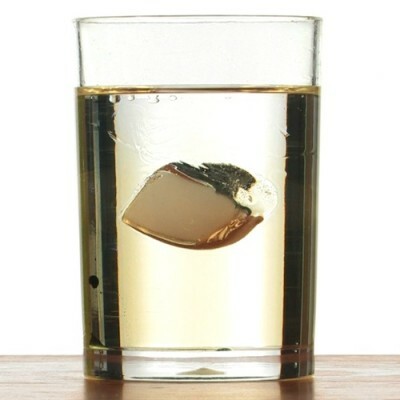 As you likely know, ice cubes are frozen bricks of water. What you may not know, is that water reacts unlike almost every other material on earth when it freezes – it becomes less dense. That’s right! Other than water and some types of rubber, materials become more dense when they cool and freeze. As you can see in the Light Ice, Heavy Water experiment, however, ice is actually less dense than water and vegetable oil. Pretty, cool, and pretty cool! To perform this experiment and get the step by step instructions, please visit the Light Ice, Heavy Water experiment page. Can someone tell me why the ice isn’t floating? It slowly sinks to the bottom everytime. 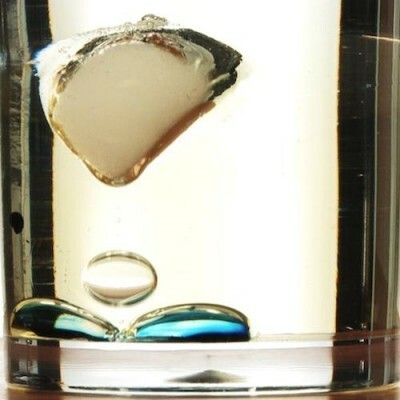 I am wanting to use this experiment for a lesson on density in my class but its not working. Hi Triosha – we have had a few other people who have experienced similar results. We suggest you try different vegetable oils to get it to work. Some may be “lighter” than others. In our experiment, we used the cheapest store brand available. Good luck! Can i know the hypothesis,aim, manipulated ,responding, constant of this experiments?? Hope you can reply it. Thank you ! !